Be sure to stop by the Hanna Gallery and say hi during your stay! Need more room, be sure to also reserve the Fountain Suite. Already planning my next stay! Spent the night with my 3 granddaughters ages 11, 13 and 15. 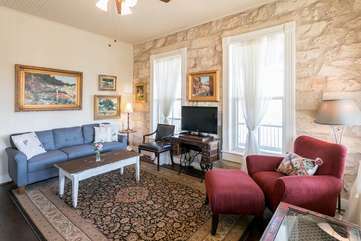 The suite was perfect, we enjoyed sitting on the porch watching the happenings on Main Street, playing games and making memories. The suite was clean, comfortable, and historical. It was convenient to restaurants and shopping also. Awesome location, beautiful balcony! Will definitely book again! Stayed there for our 29th anniversary. Great location. Walking distance to pretty much everything. I love the older buildings and architecture. Very nice and clean. Would definitely stay there again. Loved this location! Convenient, clean and comfortable! You will not find a better location in Fredericksburg. Nighttime balcony sitting was a highlight of the trip.